Three different handstamps were used - Type 1 with two +'s, above each other, after 101 - Type 2 with a + either side of 101 - Type 3 with a dot either side of 101. Poczta Polowa 101 was first opened on 20 August 1941 in Sidi Bishr, Alexandria, Egypt and left for Palestine on 30 April 1942. From 1 to 5 May 1942 it was open in Qastina, Palestine. From 5 to 29 May 1942 it was open in Gedera, Palestine. From 29 May 1942 to 23 October 1942 it was open in Rehovot, Palestine, when it left for Iraq. From 1 November 1942 till 13 August 1943 it was located in Baghdad, Iraq. On 6 March 1944 it opened in El Qassasin in Egypt and remained there till it was finally closed down on 6 April 1948. Poczta Polowa 102 was first opened on 30 April 1942 in Cairo, Egypt. It remained in Cairo till 3 January 1947. During this period it was located at several different addresses in Cairo. It was moved to El Quassasin, Egypt where it was disbanded and merged with Poczta Polowa 101. Poczta Polowa 103 was formed in El Qassasin, Egypt to cope with the increased volume of mail in Poczta Polowa 101. 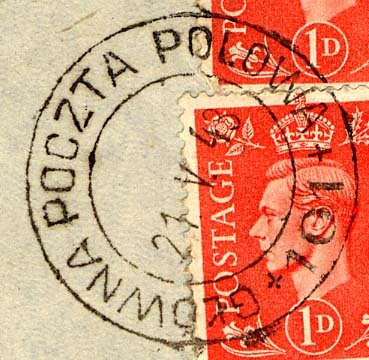 The date stamp was in use from 9 March 1944 till Poczta Polowa 103 was disbanded on 27 August 1947. 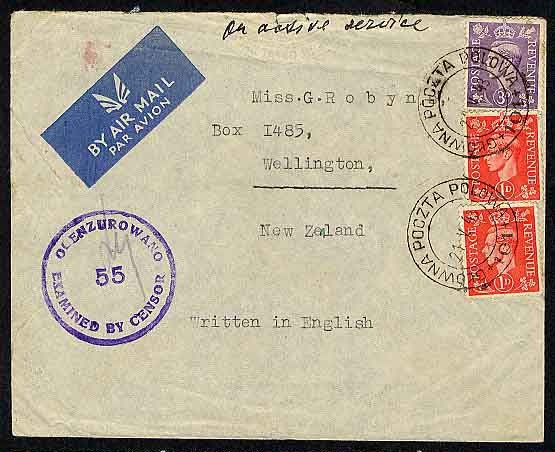 Poczta Polowa 104 datestamp 6 IV 1944 (in Bari, Italy) used on reverse of cover from Poczta Polowa 117, posted on 3 4 1944, to Tehran. 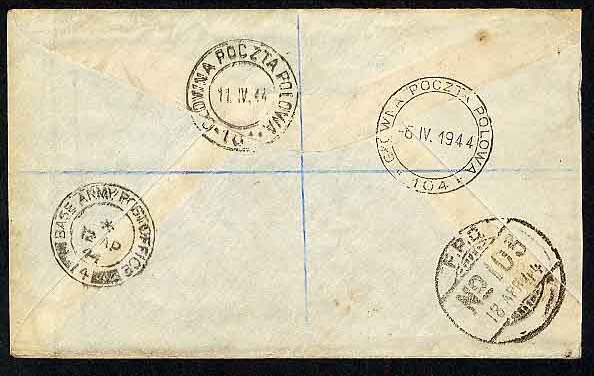 Backstamped 11 IV 1944 by Poczta Polowa 101 (in Egypt), 12 AP 44 by Base Army Post Office 4 (in Egypt) and 18 APR 44 by Indian FPO 103 (in Tehran, Iraq). Poczta Polowa 104 became active on 17 February 1944 in Bari, Italy till 5 September 1944. It then moved to Napoli, Italy where it remained till 9 December 1946 when it closed and all the staff left for Edinburgh, Scotland. Poczta Polowa 106 was established in Habbaniyah, Iraq in May 1942. 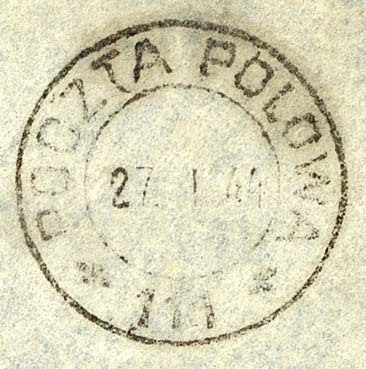 The Poczta Polowa 106 datestamp was introduced on 19 February 1943. 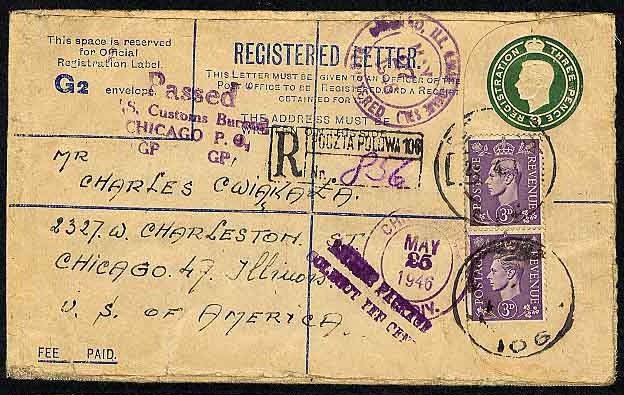 The office was closed on 23 September 1943 for moving to Baghdad. From 30 September 1943 to 5 November 1943 it was open in Baghdad, Iraq. On closure all staff and stores were transferred to Poczta Polowa 101 in Rehovot, Palestine. 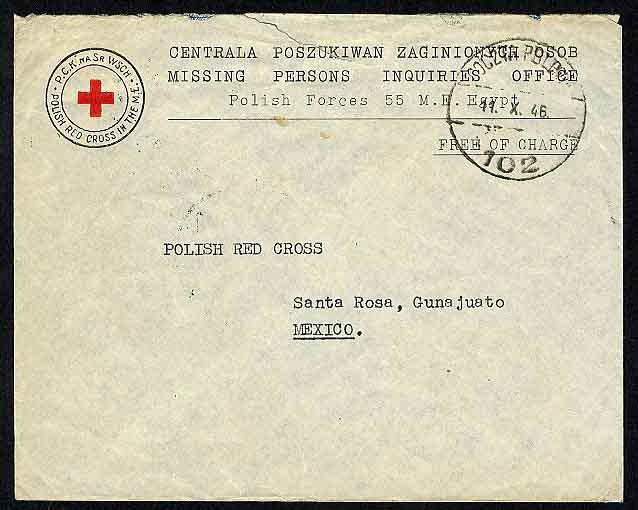 On 15 March 1944 Poczta Polowa 106 was briefly reopened in El Qassasin, Egypt and closed on 20 April 1944. On 1 December 1944 it was reopened in S Basilio near Mottola, Italy where it remained till it was finally closed on 29 October 1946. From 16 May 1945 till 13 October 1945 the office was in El Amiryia near Alexandria, Egypt. From 16 November 1945 till 9 December 1945 it was in Acuaviva near Bari, Italy. On 14 December the office moved to Chieti, Italy where it remained till it was closed on 21 June 1945, when all the staff departed for the UK. 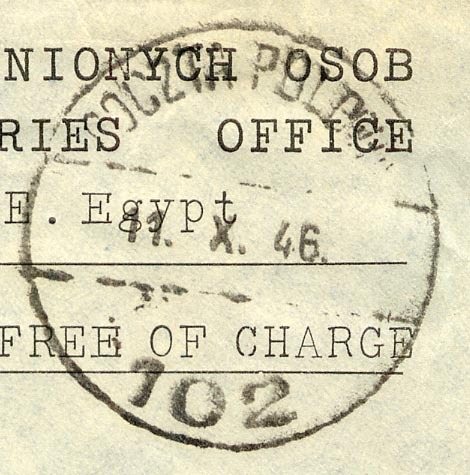 The BSK Field Post Office, which was originally opened in Syria, moves to Latrun in Palestine and reopens as Poczta Polowa 111 on 13 July 1940. 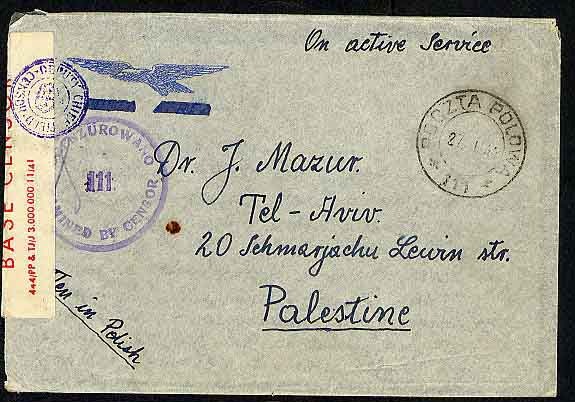 From 1 May 1942 the office was in Qastina, Palestine till 5 October 1942. On 13 October 1942 it reopens in Jalaula, Iraq till 24 November 1942. Between 6 May 1943 and 7 August 1943 it is open in Altun Kopru, Iraq. 23 December 1943 till 14 January 1944 in S Teresa near Taranto, Italy. This office moves as the Polish and Allied troops advance northwards through Italy. 15 January 1944 to 27 January 1944 in Massa Abbondanza, Italy. 28 February 1944 to 26 March 1944 in Castelpetroso, Italy. 11 April to 26 April 1944 in Castelpetroso, Italy. 7 July 1944 to 30 August 1946 the office is located in Cupra Marittima. On closure all staff depart for the UK.